Kinetik Wellbeing wants to make the monitoring of blood glucose straightforward and easy to access for everyone. For this reason, their Blood Glucose Monitoring System is of great value for money, with no compromise on quality, while also being intuitive to use. Kinetik Wellbeing’s certified Blood Glucose Monitoring System provides rapid and simple blood glucose testing that is minimally invasive. The device’s contemporary design provides readings on an LCD-backlit display, can save up to 500 readings and provides results within 5 seconds. The Blood Glucose Monitoring System adheres to the EN ISO 15197:2015 standard and can be used at home immediately with no need for coding or set up. 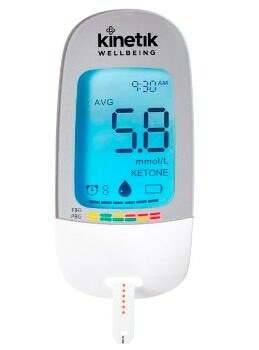 Kinetic Wellbeing’s system allows their customers to monitor their own blood glucose levels. This gives people the power to be informed about their current health and to make decisions that minimize the impact of Type 2 Diabetes. Class IIa Medical Device with CE certification. Kinetic Wellbeing wants to provide the best value possible for their customers. For this reason, if customers see any of their products available for cheaper at any credible online or offline retailer, they will happily match the price. Kinetic Wellbeing has partnered with the UK’s primary charity first aid provider, St. John’s Ambulance, to provide health management and monitoring systems. These include health kits, blood pressure measurement, relief from allergies and pain, and electric thermometers.